Add the powdered sugar, slowly pouring into the bowl and whip until combined. In a measuring cup, mix cocoa powder with 2 tablespoons of water to make a paste. Add up to 4 more tablespoons to make it pouring consistency. Add to your whipped milk and whip until combined. Pull out from the freezer, whip for 1 minute and back to the freezer. Place in a container with a lid. Store in the freezer. 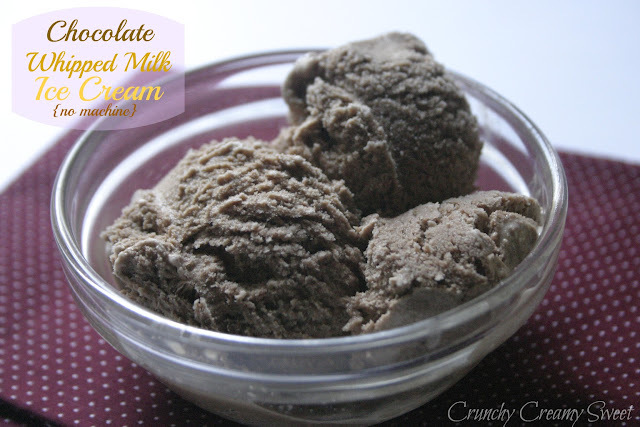 To see the photo tutorial on making this type of ice cream, click here. This ice cream is not as soft as the vanilla one. We are adding water with cocoa powder to the mixture so they will be harder and won’t melt as fast. They will freeze faster too. I actually had to do the freeze-and-whip cycle only twice. Start in the morning and by dinner you have ready ice cream!! What a great ice cream recipe. I have never made one without the machine. All the treats look delicious fun foodie party. I could make ice cream every week this time of year;-) Great foodie party with many interesting recipes! that ice cream looks awesome!! i definitely need to try this out! Yummy!! I was hoping for a chocolate version! Hi Anna – oh boy this ice cream looks tempting and tasty!!! I might just have to give it a whirl 😉 Have a wonderful weekend!!! Your frozen treats are welcome at my house anytime. This looks so creamy and delicious! Like the ease of this, thanks for posting this one Anna! arrrrgh…just notice it starts raining AGAIN! I am going to make some ice soon! Hope we have a rain-free and warm weekend! Fabulous recipe, Anna, and so easy! I have linked it. Do let me know if this works. Did you use the linky tool to link up your chicken recipe? I am not seeing it so far..
Ouch! I had not, but now I have. I am very new to blogging in general, and linky parties in particular (like one day old)and often miss the links. I wonder if my recipes have shown up at other places. Thanks so much! Chocolate Ice-cream looks great! Thank you for hosting, following you. Have a great day! Thank you, Ambreen! Welcome to the Party and CCS! Thank you for hosting 🙂 have a wonderful weekend! You too, Abby! Thank you! I'm so excited that my oreo cheesecakes were you fav of last week =) btw, Ice cream is my all time favorite dessert. I can eat it in negative 20 in the winter, I love it that much. Even better yours doesn't use a machine, love it! My Hubby loved it more than the vanilla kind 🙂 They are soooo gooood! Hope you will make them! Thank you, Neshanne!